As many of you know, I have been competing in a very cool contest for BaoBaoBags.com The contest ended January 15th and unfortunately my Dead Icon didn’t win. RatZ! However, I did receive 300+ votes from Landisworks fans all over. I am so grateful for the generous (and time consuming) voting. Thank you! Fifty+ of you let me know you voted. So…I entered you in my private “Dead Icon ‘Elvis’ Mug Raffle”! The five winners of mugs are Carol McMahan, Clifton Grim, Kristina Konen, MaryJane Bernard, and Mirjana Mladinov. Congratulations to my winners! January is the month of Elvis Presley’s birth. It is a special month for me too! Barbara Atkinson, Director of the Superstition Mountain Museum asked me to extend my Elvis Art Exhibit in the Bridal Dressing Room of the Elvis Presley Memorial Chapel indefinitely! 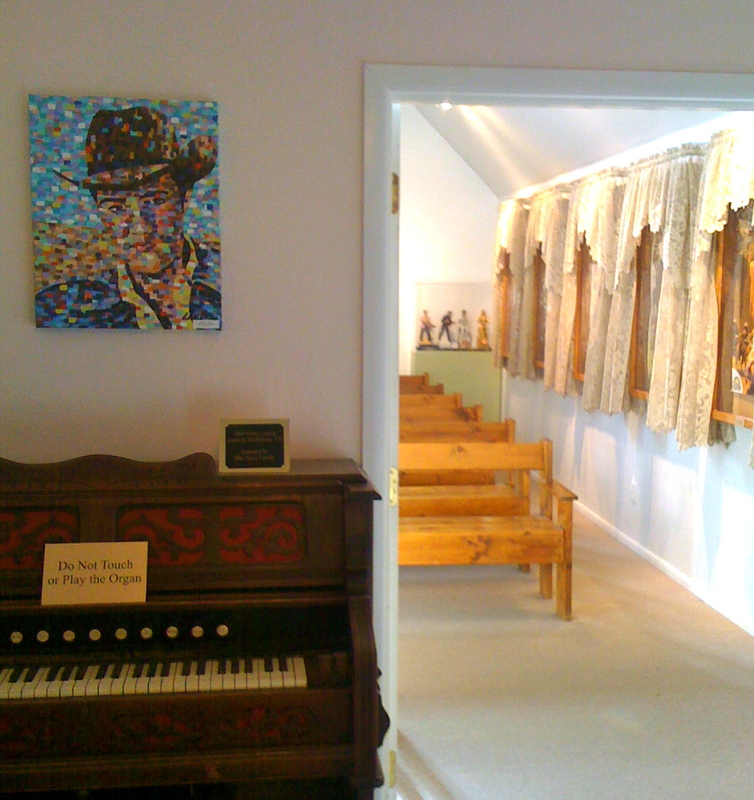 The Elvis chapel is a historic site that many Elvis fans and curious guests visit every year. Admission is free. The original site of the Elvis chapel was at the Apacheland Movie Studio once located a few miles from the museum’s current location. Many films & TV shows, including the Elvis Presley’s Charro, were filmed at the original Apacheland Movie Studio. Unfortunately, the movie studio burned down except for the barn and historic Elvis chapel in 2004. Both were carefully moved to the scenic grounds of the museum in Apache Junction, Arizona. Apacheland Days is all about old westerns, movie/TV stars, and legends. Next weekend (1/14-16) the yearly celebration hosted by the Superstition Mountain Museum in Apache Junction, AZ. Many films and even Elvis’s movie “Charro” were taped at the original Apacheland Movie Studio once located a few miles from the museum. Unfortunately, the movie studio burned down except for the barn and Historic Elvis Chapel years ago. Here’s hoping that your end to 2010 is satisfying to all your senses. 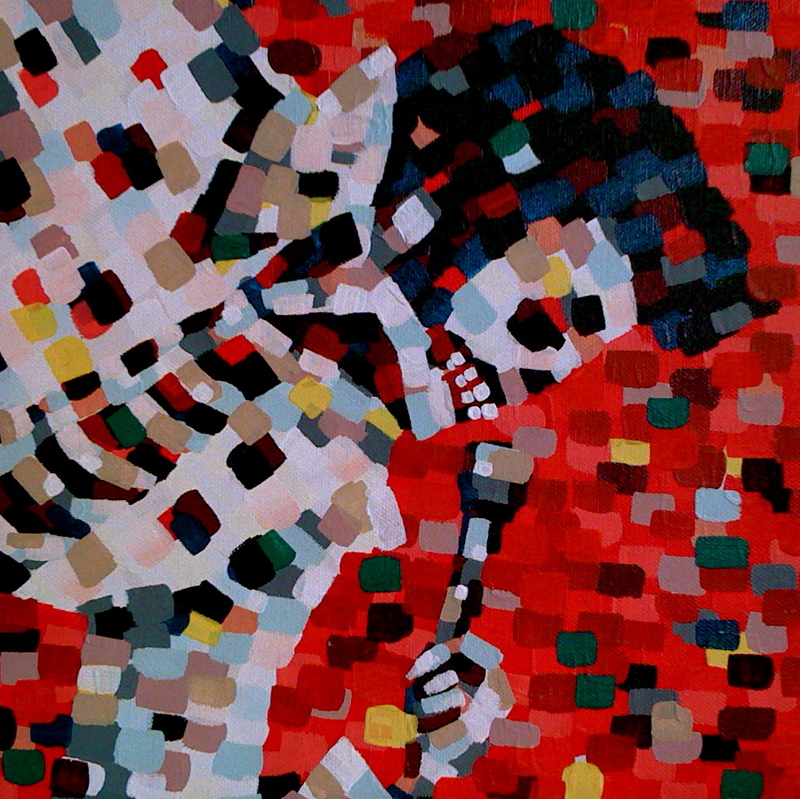 My “Dead Icon” Elvis painting needs your votes in BaoBao Bags future artist competition! The company sells backpacks with interchangeable art buttoned to their backs. Very smart! Go to http://www.baobaobags.com/pages/home to vote once a day during the open voting period for my group starting Friday, Nov 12 – Nov 22nd. Click on the orange “VOTE” button to see eleven art works in the current round. Scroll down till you see my painting and check it. 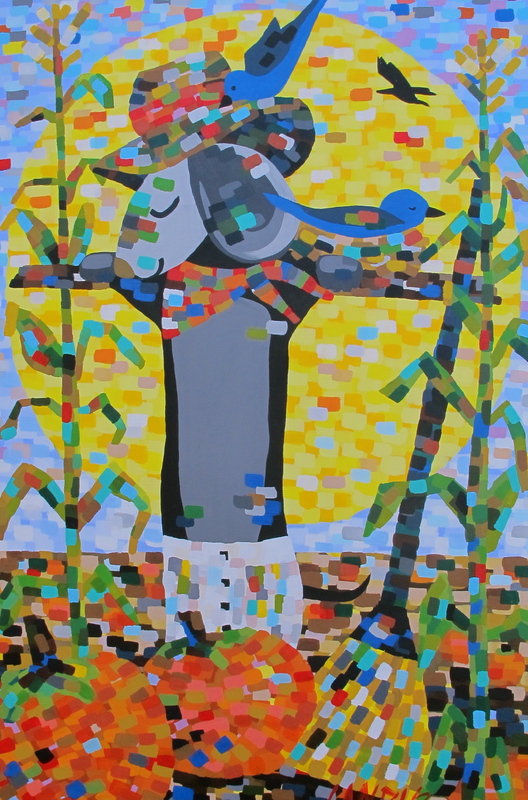 You can vote for three pieces each day. Social networking is a must to win! I would really appreciate you sharing this with friends and networks. Just hit the site’s “SHARE THIS” button after voting. BaoBao Bags will automatically post the voting page to your Facebook, Twitter, etc. pages. If you like my painting, suggest it to your friends too. I hope to win & potentially become one of their designers! I really appreciate you taking the time to vote! P.S. Their backpacks might be good presents for the holidays! The Wild and Scenic juried exhibit is on display for thirty days showcasing the art of twenty-nine Arizona artists. But come to our opening reception and enjoy all the activity happening just outside the gallery on Main Street such as live music and local artist booths. Dress is casual. Join us! 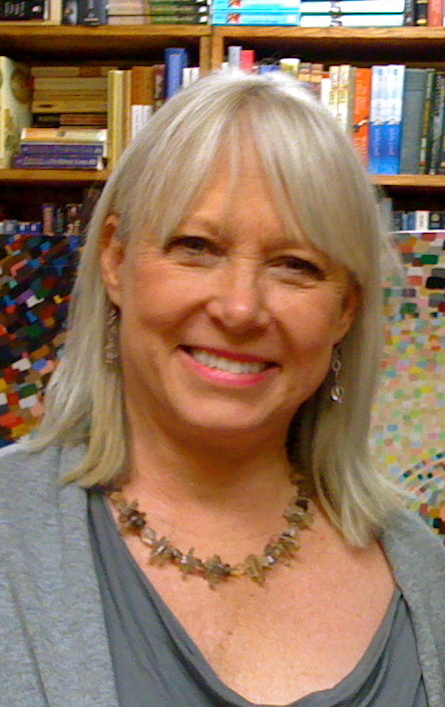 The personal technique of Denise Landis is called Modified Pointillism. Denise uses the basic color theory of classical pointillism but focuses most on complimentary colors vs. superimposed color mixing to create new colors. Opposing complimentary colors are interspersed for either subtle or vibrant intensification. One color is painted over the complete canvas and allowed to dry prior to adding another color; thus allowing equal color representation throughout the canvas surface. She paints over the whole canvas many, many times prior to completion. Strokes are rectangular shaped dabs of acrylic paints. 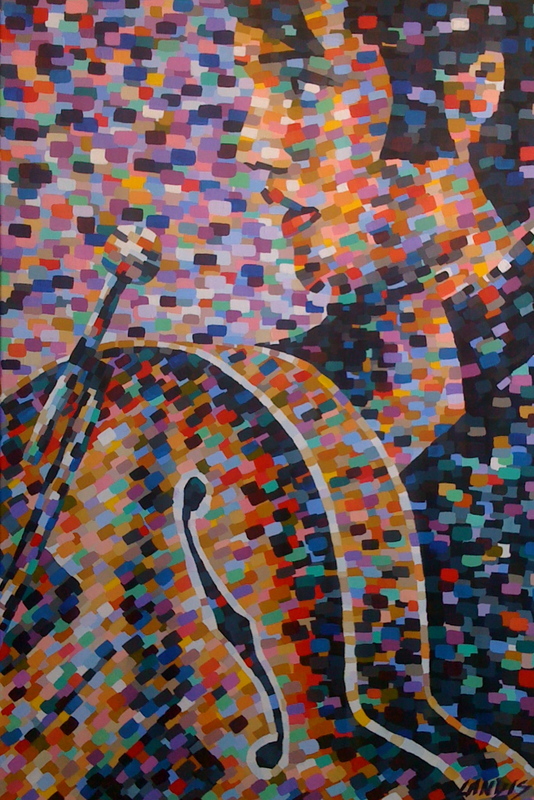 Denise incorporates specific musical rhythms to maintain similarly shaped dabs for the painting’s rhythm. The ocotillo is a favorite desert cactus. It’s oddly shaped body of “arms” shoot upward to the sun. Denise Landis’ painting reflects this unique plant from her modified pointillism perspective. Background colors of yellows, lavenders, reds, teals, and greens are ever-present in the southwestern desert during Arizona’s Wild and Scenic “blooming” springtime. This ocotillo plant itself is black with deep red tips for blooms. 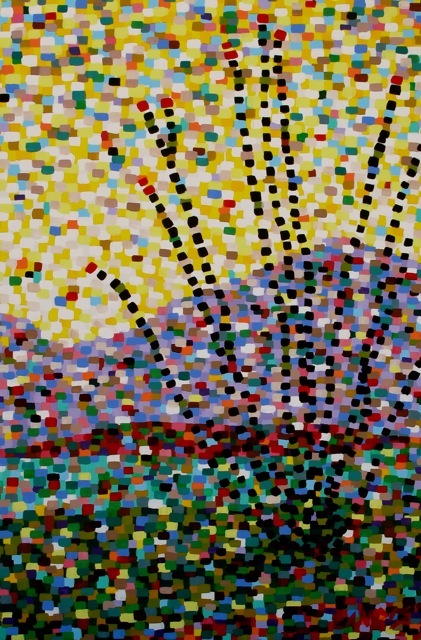 Music by INXS was used to create this painting’s rhythm. For all you Michael Jackson fans, check out this pointillism artist’s project. 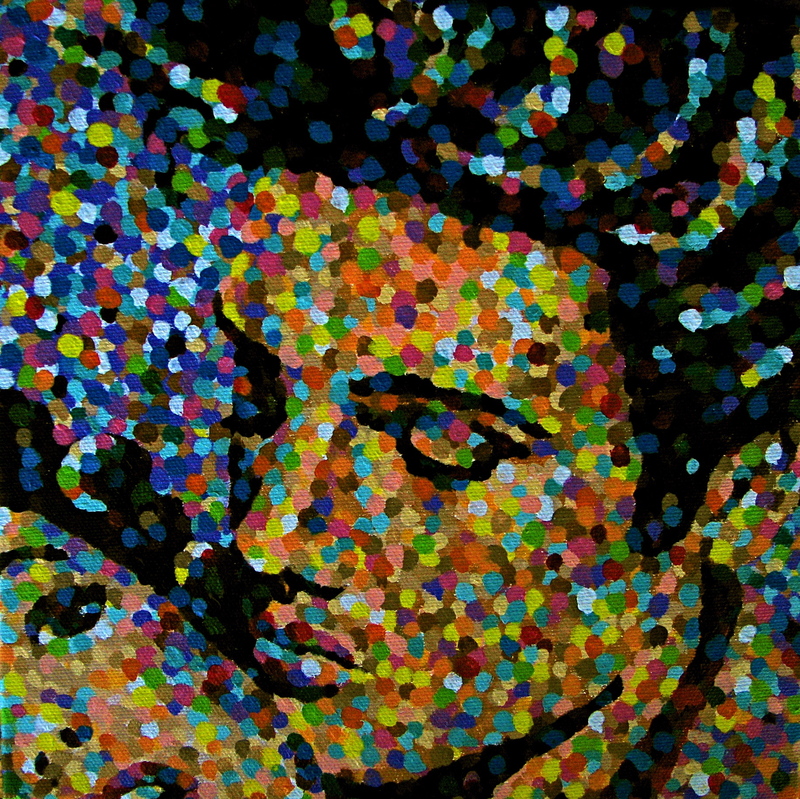 You can be a “dot” on this Michael Jackson Tribute Portrait! I think this is a great concept and could be used by other pointillism artists with special interests. Comments? Ideas?